Sometime last year i presented u my “new discovery” (@ that point in time) : Justin Bua!!! A few months ago i finally could buy his book The Beat of Urban Art – The Art of Justin Bua and since i got it im all over it!IT IS AMAZING!!! 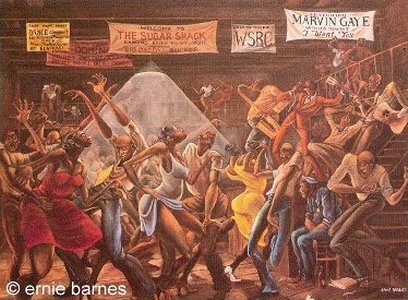 so as usual a likkle sum sum ’bout Ernie Barnes than ill post the link to his website where u can and i hope u will as well as i hope u will check justin’s website! Ernest Eugene Barnes Jr. was born July 15, 1938, in a poor section (“the bottom”) of Durham, North Carolina. His father, Ernest Barnes Sr., worked as a shipping clerk at Liggett Myers Tobacco Company and his mother, Fannie Mae Geer, was employed as a domestic for Frank Fuller Jr., a wealthy Southern attorney who would guide Barnes into the world of art. By the time Barnes entered the first grade, he was familiar with the works of such masters as Toulouse-Lautrec, Delacroix, Rubens, and Michelangelo. By the time he entered junior high, he could appreciate, as well as decode, many of the cherished masterpieces within the walls of museums — although it would be a half dozen more years before he was allowed entrance because of his race. Overweight and extremely introverted, Barnes was a target for ridicule from the time he started the first grade through his junior year in high school, continually seeking refuge in his sketchbooks. Unfortunately, the sensitive young man could not avoid the issue forever. Nature had played a cruel trick; Barnes had grown too tall to overlook. He finally reported to the coach’s office, got weighed, assigned a locker, and outfitted with pads, helmet and practice gear. Dismally out of shape and lacking the killer instinct necessary to survive serious injuries on the field, he quit after two practice sessions.